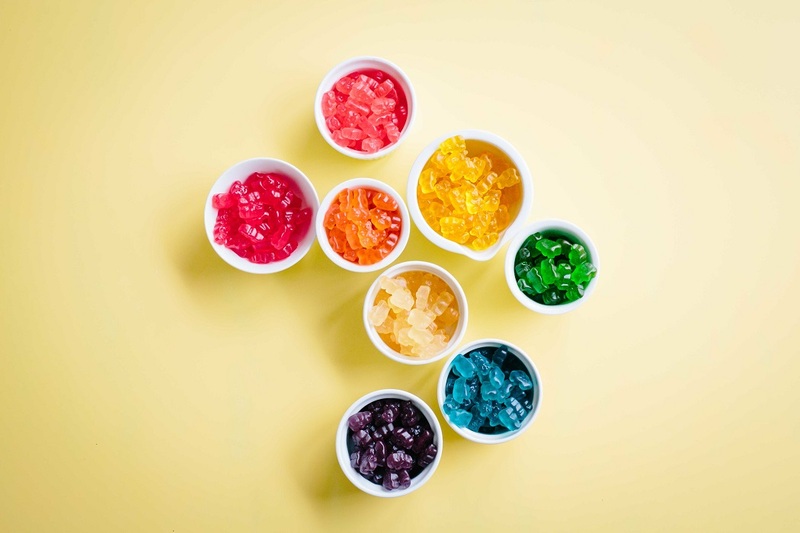 Gummi, gummy, gummies, or jelly candies are a broad category of gelatin-based, chewable sweets. Gummi bears are widely popular and are a well-known part of the sweets industry. Gummies are available in a wide variety of shapes including bears, bottles, worms, frogs, hamburgers, sharks, toy soldiers, full-size rats, large human body parts (such as hearts and feet), Ampelmännchen (the little figures on pedestrian traffic lights in Eastern Germany) and even the Smurfs. Various brands such as Haribo, Betty Crocker, Disney and Kellogg's manufacture various forms of Gummi snacks, often targeted at young children. The candy and the name "gummi" originated in Germany. The gummi bear originated in Germany, where it is popular under the name Gummibär (rubber bear) or Gummibärchen (little rubber bear). Hans Riegel Sr., a candy maker from Bonn, produced these sweets under the Haribo company, which he started in 1920. CHUCKLES JELLY CANDY 2OZ WHAT IS YOUR FAVORITE JELLY? CHERRY, LEMON, LICORICE, ORANGE OR LIME?